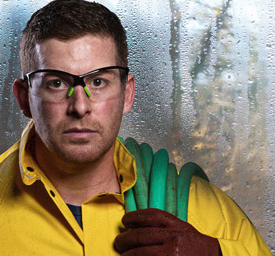 Brass Knuckle, a provider of high-quality safety solutions, offers two models of safety eyewear. Brass Knuckle, a provider of high-quality safety solutions, offers two models of safety eyewear that provide more than typical anti-fog eyewear properties. The facts: EN166/168 is the only anti-fog standard for protective eyewear; there is no ANSI standard for anti-fog protection. So when you have experienced poor quality anti-fog protection on safety glasses, it is likely they were manufactured with zero adherences to a standard of any kind. Meet Snap (BKFIX-3100NP) and Mega (BKDST-1030NP). Regardless of whether you have water spray, wastewater, high humidity, or dramatic changes in temperature—these glasses don’t steam up. Snap and Mega are manufactured to exceed anti-fog standard—EN166/168. Both products feature Brass Knuckle’s proprietary N-FOG PLUS lens coating, which delivers anti-fog protection more than 40 times greater than what is required, exceeding the world’s standard by 300 percent. Snap (BKFIX-3100NP) gives you ultra-light comfort and crisp vision even in the wettest, most humid conditions. With a high-fashion vibe and sporty design, Snap features glossy black temples and a partially rimless design with dynamic green accents on the temples. A soft, flexible PivotEase nosepiece locks Snap into a no-slip position. Brass Knuckle included TempleTouch grip dots on the inside of the temple to maximize wearer comfort, and reduce pinch points behind the ear. Mega (BKDST-1030NP) features a cushioned foam dust protector designed to help prevent fine particulate matter from falling into or behind the frame and lenses. Its application-specific, interchangeable design allows Mega—with the push of a button—to transition from a snug-fitting dust goggle with adjustable-length temples to a hold-even-tighter dust goggle with a strap. All dust goggles in the Brass Knuckle line meet or exceed the EN166/168 standard for anti-fog performance; however, only the Mega includes N-FOG PLUS anti-fog coating. In addition to the clear lens, Mega is also available in smoke. In addition to their anti-fog properties, Snap and Mega include heavy-duty impact, abrasion, and UV-resistance properties (ANSI Z87.1+, EN 166K, EN166N, EN 166UV).